Increase in weight during pregnancy is very common. A pregnant women gain 17 to 22 pounds (8 to 10 kg) weight during pregnancy. But the ideal weight growth during pregnancy depends on the weight before the pregnancy. 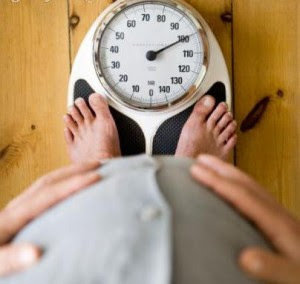 Normally in weight related issues, the nature of the body can be calculated by Body Mass Index ( BMI). In general if BMI is 18, they are considered underweight. Women between 18.5 to 24.9 BMI are normal weight. 25 to 29.9 Body Mass Index women are overweight, 30 and above are obese. Women who are underweight can gain upto 33 pounds (15 kg) during pregnancy, without any major problems. But obese women are advised to keep their weight growth between 11 to 9 pounds (5 to 9 kg). On average or normally a pregnant women weight may increase by 0.44 t0 1 pounds (200 to 500 grams) every week. In some pregnant women who experience vomiting very frequently may not gain weight for even 20 weeks. This (not gaining weight) does not affect their normal health and also healthy pregnancy, but a medical checkup should be done. In pregnancy the idealistic or the right way to gain weight is by eating food in small portions 5 to 6 times in a day. A nutritious diet that includes boiled eggs, milk, fruits, nuts and sprouts is good food for pregnant women. Non vegetarians can eat chicken and fish but not deep fried. A baby in the womb feeds itself anyway from the mother, so it is very important for any pregnant women to take right food in right amounts. But underweight women need to gain quick extra weight by taking dairy and healthy fat products.